Since July 1, I have been on the road. I left Vancouver on July 1st for Ottawa. The weather was beautiful that week in Vancouver, so I found it really hard getting on the plane. It was a few weeks ago now, but I still remember the sunny haze that hung over the mountains as I drove to the airport. 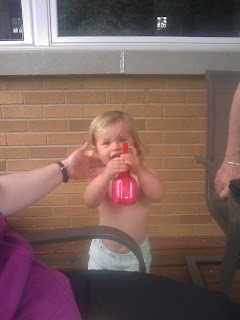 Arrived in Ottawa and made my way to the cottage the next day to see the family. My brother was there with my nephew Tate. I don't have any good pictures of him... but soon. We had dinner as a family for the first time in a while. In case you don't know, the weather around Ottawa has been terrible all summer and that has pretty much summed up my time here so far. I suppose the good thing is that I have been so busy hunting down job opportunities, that it hasn't really affected me too much. (it just started raining in Ottawa as I write this very sentence). Being back in Ottawa during the summer has really interesting. I haven't really spent much time here since I left for university in the fall of 1995 so my memory of the city is often hazy. I can get close to where I need to go, but then I'll make one wrong turn somewhere right near the end and get lost. Either way, it's good to be back and was able to get some interviews in while here.... maybe something will work out... we'll see. Then, I spent a few days in Toronto. At first, I didn't like it. Toronto used to feel like home to me. I lived a few places but my last apartment there was at Queen and Spadina, right downtown. This time, I found myself like a stranger or a tourist in a city that used to be my backyard. After a bit of time I started to warm up to it. Met with a recruiter and I think there will lots of opportunities for in Toronto. Drove to my cottage and left the next morning for Montreal. Now Montreal - there's a city for you. Sunday afternoon, we went to Picnik Electronique to see Justin Long, JT Donaldson and Fred Everything. I hadn't heard any good house music in a while and all I can say is this: The last hour where Justin, JT and Fred went back-to-back erased that pretty quickly. Good times. The rest of the time was divided between interviews, waiting for interviews and trying to see the city a bit more. Montreal has such great resto's, bars and clubs. It's beautiful and what impressed me the most since I was last was how bike friendly it is. There were bike lanes everywhere! Now I'm back in Ottawa again. This weekend is going to be a weekend off for me... then I think it's back to Vancouver next week! <-If you like "flats", check out Pretty Ballerina. First North-American store opening in Montreal soon! 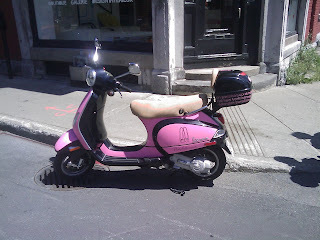 My friend Nick's new Vespa will promoting pbnorthamerica this summer in MTL. 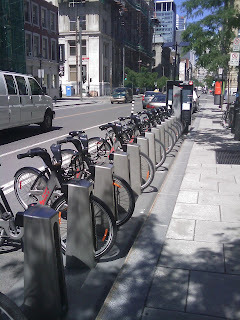 This is BIXI bike in MTL and my niece Ella!